Rome - The city which eventually grew into the most powerful empire of the ancient world. Legend says it was founded in 753 B.C. by brothers Romulus and Remus. 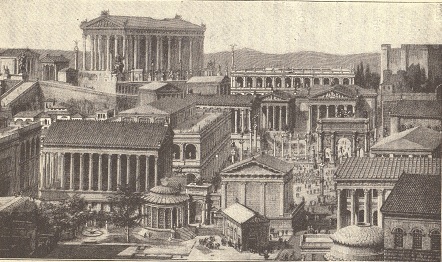 At its height it grew to a population of over one-million people (a mega-city by ancient standards) and remained the capital of the empire until Constantine moved it to Byzantium (Constantinople) in 330 A.D.. After that it entered a decline and was sacked by the Visigoths in 410 (the first time in 800 years). While the city endured and survives to the present-day, the Western Roman Empire fell in 476.